With the beginning of spring comes the rain we need to start our gardens, plant our flowers and achieve that lawn that makes our neighbors envious. While the old saying “April showers bring May flowers” is true, any showers can also bring potential hazards that we all take for granted. We are talking about storm water pollution.Here are some helpful tips we can all use to reduce storm water pollution that many do not even realize they contribute to. 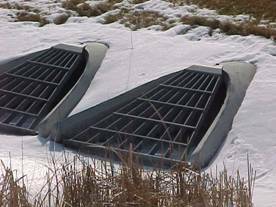 Storm water is water from precipitation that flows across the ground and pavement when it rains or when snow and ice melt. The water seeps into the ground or drains into what we call storm sewers. 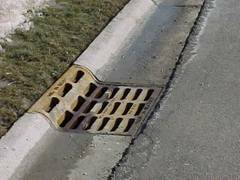 These are the drains you see at street corners or at low points on the sides of your streets. Collectively, the draining water is called storm water runoff and is a concern to us in commercial and industrial sites as well as your neighborhood because of the pollutants it carries. Where Does The Storm Water Go After It Drains Into A Storm Drain? Storm water that does not seep into the ground, drains into systems of underground pipes, ditches or creeks and may travel for many miles before being released into Lake Michigan. Did You Know That Not All Substances That Enter Storm Drain Inlets In The Street Can Be Removed Before They Enter Lake Michigan? Those substances that enter the storm drain system are not treated at all! Anything poured into a gutter or a storm drain, such as used motor oil or antifreeze, flows directly to Lake Michigan. What Are Common Contributors To Storm Water Pollution? When it rains, oil, antifreeze, detergents, pesticides and other pollutants get washed from driveways, backyards, parking lots, and streets into storm drains and then directly to Lake Michigan untreated! The following items specify everyday pollutants occurring |at our homes, businesses, and construction sites. Pet waste left on the ground gets carried away by storm water, contributing harmful bacteria, parasites and viruses to our lake. Please clean up after your pet. Vehicle fluids such as oil, gas, and antifreeze are the #1 surface water quality problems nationwide. Recycle used oil in a clean, sealed, plastic container. Please call the SWALCO) Solid Waste Agency of Lake County at (847) 336-9340 for a list of collection sites that accept used oil or for answers to questions regarding proper disposal of other chemicals. Please try sweeping. Hosing off pavements washes pollutants into storm drains leading straight to the Lake. Deliver old paint, pesticides, solvents and batteries to available hazardous waste drop off facilities. Call (847) 336-9340 for more information. Street litter such as styrofoam, plastic, and paper can be prevented from blowing into inlets by keeping trash bins covered and by not littering. Remember, Zion can be very windy! Yard waste such as grass clippings, tree trimmings, and leaves can be composted and used for fertilizer around the yard. They can also be picked up on your regular garbage pick up day if placed in bio-degradable bags or clearly marked 30 gallon containers. Washing vehicles or equipment in wash bays hooked up to the sanitary sewer. Don’t wash off detergents, oils, and greases into streets or storm drains. Waste and processed water of any type must be discharged to the sanitary sewer. Discharge of wastewater to the ground or storm drains is prohibited. Again try sweeping. Hosing off pavements washes pollutants into storm drains leading straight to the lake. Be sure to know spill cleanup procedures. Have cleanup materials nearby with a spill prevention plan prepared and procedures known by all employees. Waste from chemicals and materials used in construction can wash into storm sewers leading to our lake during rainy weather. Soil that erodes from construction sites can contribute to environmental degradation. Listed below are other harmful contributors from the construction site. Sediments and other debris clog fish gills, damage fish habitat and block the light needed for the plants to survive. Wash waters from concrete mixers should be disposed of back at the contractor’s site or a large hole, big enough to contain all the wash waters. Never rinse out concrete truck chutes with a hose and allow it to run down the street gutter into the storm drains. Waste storage for used oils, solvents and other hazardous fluids must be under cover with secondary containment in case of a spill and to prevent it from rainfall contact, which would wash hazardous fluids into nearby waterways. all contribute to soil erosion. 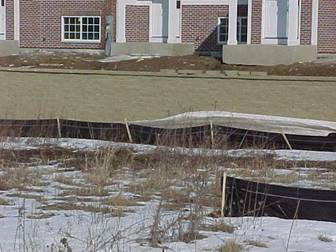 Silt fences to hold back loose soil and sand when it gets windy or rains allowing sand and soils to stay out of street gutters where rainwater can wash it into storm drains. Vehicle and equipment maintenance becomes a significant factor when engine repairs or preventive maintenance such as changing oil and other fluids occurs at the construction site. Maintain a “dry site” by using off site facilities, performing work in designated areas only, providing cover for materials stored outside, containing and cleaning up spills immediately, and training employees and subcontractors. 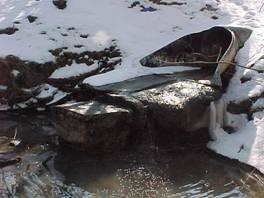 Report illegal dumping to storm drains by calling (847) 746-4062. With everyone’s help and cooperation we can all do our part in reducing pollutants to our creeks, streams and our source of drinking water, Lake Michigan. Please click on this Lake County Stormwater Management Commission link for specific references related to the Watershed Development Ordinance.